"This jack-of-all-trades, brushed stainless steel waffle maker overwhelmingly earned our top spot." This jack-of-all-trades, brushed stainless steel waffle maker overwhelmingly earned our top spot on this roundup—and for good reason. It offers a little bit of everything. Need a space-friendly appliance? Its compact design is a perfect addition to even the tiniest kitchens. A unique weighted lid keeps batter from oozing out as waffles cook. You’ll find several rubber feet beneath this unit, protecting your countertop from scuffs and keeping the waffle maker from sliding around on slick surfaces. You'll have full temperature control at your fingertips by selecting any of the five browning settings. Red and green signal lights alert you when the iron is hot enough and when the waffles are done—no more lifting the lid too early or ending up with charred waffles. After it has cooled, the waffle iron is easy to clean with a dish brush for crumbs and a damp dish cloth to remove any cooking oil or stuck-on batter. Then the cord wraps around the base for easy storage. In the mood for high-quality Belgian waffles? Look no further than this powerful, 1,100-watt premiere appliance—the veritable champion of Belgian waffle makers, according to its top seller status on Amazon. A unique rotating design instantly flips batter 180 degrees, resulting in a uniform spread. With a cook time of less than 4 minutes, breakfast is ready in no time. And a countdown timer on the digital display clearly states just how much time each waffle has left to cook. The fold and lock feature allows the unit to be stored upright, saving space in your cabinets. But keep in mind that the plates of this waffle iron should be seasoned before use to prevent your breakfast from sticking and making a mess. This waffle maker leads the list in affordability, making it a great choice if you've never owned a waffle maker before. And if you don't end up using it often enough, you won't feel bad donating it or gifting it to a friend. Not only is it cheap, but the interior Teflon coating provides a nonstick cooking environment, making it easy to clean up. Of course, the Teflon coating does come at a slight tradeoff as the waffle exteriors aren’t as crisp as they would be when cooked in a cast iron unit. The deep rimmed design of the waffle plates helps prevent spills and overflow while cooking. Despite the low price, this unit is durable. You'll be able to enjoy delicious, homemade, 8-inch waffles for the long haul. And the cool touch handles mean you can move this light, 3-pound appliance across the counter without burning your fingertips. And because the Oster Belgian Waffle Maker comes with a 1-year warranty, it's good for the accident prone. However, since it only prepares one waffle at a time, it’s not ideal for large waffle-loving households. Otherwise, it’s a low-risk/high-reward option that sells for less than $20. To buy an indoor grill or waffle maker? If you find yourself torn between the two, opt for this model from Black+Decker that lets you make a range of meals with just one appliance. Once you’ve polished off the waffle batter, switch the reversible plates and get straight to frying eggs or cooking up bacon. This versatile appliance opens flat, providing two cooking surfaces so you can get more done in less time. If you're skeptical of dual purpose appliances because you've been burned in the past, you can rest assured that this model really can multi-task well. Integrated temperature control ensures that waffles are cooked to just the right temperature. Don’t sweat potential messes thanks to the design of this unit. Residual oil is diverted into grease runoff channels, built into the edge of the grill. You won’t need any elbow grease to scrub this appliance, either. Nonstick grill plates prevent particles from sticking, making post-breakfast cleanup a breeze. The plates detach completely and can be cleaned with soap and water. Just make sure they are completely dry before storing everything away. The Hamilton Beach 26030 solves the problem of hand-wash-only waffle makers. If you want to avoid the fuss of hard-to-clean machines, this Belgian waffle maker model has the ultimate convenience feature: removable plates. The nonstick cooking grids are entirely dishwasher safe, so you can just pop them out of the machine after you’re done cooking and put them straight in the dishwasher. They take up about as much room as a dinner plate and there’s no hand-washing necessary. This model even has a drip tray to catch spillover batter, so your countertop stays spotless, too. The easy clean-up may be the most distinguishing feature, but the Hamilton Beach 26030 also makes some delicious Belgian waffles. Flip the machine in the middle of the cooking process to create perfect, evenly-browned waffles that are crispy on the outside and soft on the inside. It also has a “browning control” setting so you can have them exactly as toasted as you like. Packed house? This unique waffle maker cooks five crisp, heart-shaped waffles in one go. Yes, they are a little smaller than normal waffles, but they allow more people to start eating sooner. The quad baking system lets you customize just how crisp you want your waffles. And after a few minutes of preheating time, it takes just 90 seconds to cook each batch. Unlike other models, you don’t need to watch a light to know when your waffles are ready. Once it’s finished cooking, the waffle maker will make a noise to instantly notify you. An overflow channel keeps excess batter away from this appliance’s controls—meaning no sticky mess or ruined waffle maker if you accidentally fill it too full. Of course, there are more powerful waffle makers on the market, but this one is the crème de la crème for its price point and purpose—feeding as many people as you can, as quickly as possible. If you’re of the mindset that everything’s cuter in miniature, then this waffle maker was made for you. Its candy-colored exterior will brighten up any kitchen, and the four waffle sticks it makes will convince you that waffles are weekday breakfast after all. 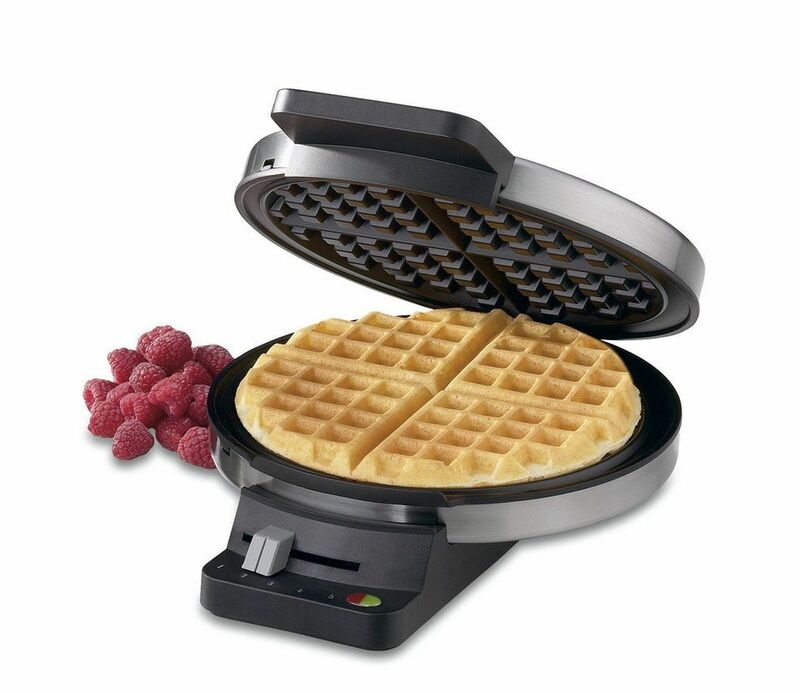 This unique 500-watt waffle maker rapidly produces four waffle sticks. While an individual waffle stick might not fill you up, they are perfect for snacking or dipping for a dessert. And because they are smaller they cook more quickly—each batch takes roughly three minutes—so you won't be left hungry for long. Constantly rushing every morning? Cook and freeze the sticks, so you and your family can have a quick, easy meal before work and school. When plugged in, a bright power light lets you know that it’s on and ready for action. Keep in mind, this appliance can’t be locked in place once opened. If bumped or moved abruptly the plate slams shuts—so make sure little fingers steer clear. Unfortunately, the recommended measuring cups, wooden sticks, and metal shaker are not included with this version. 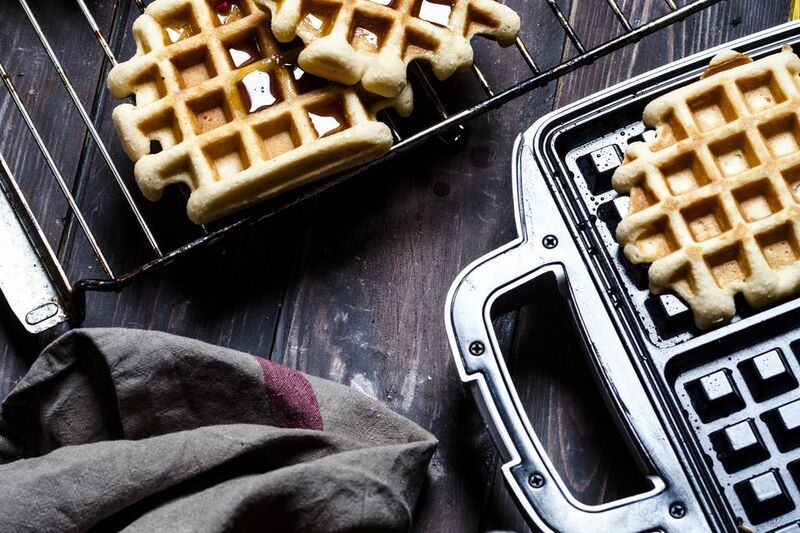 If you want to go old school with your waffle maker, or you don’t have counter space or storage space for an electric model, this stovetop waffle maker can be fun to use. It makes Belgium style waffles using just the heat of your stove. It couldn’t be easier, just preheat waffle maker, pour in the batter, close the waffle maker and cook on the first side before flipping it over and cooking for 2-3 minutes more. Recipes are included to get you started making great waffles. The waffle maker is made from cast aluminum and has plastic handles that stay cool during cooking. It should be hand washed. This is definitely the most expensive option on our list, but if you are a die-hard waffle lover on the hunt for a truly premium machine — it doesn’t get any better than the Breville Smart 4-Slice Waffle Maker. This is the Rolls-Royce of waffle-makers, outfitted with five different cooking presets (Belgian, Classic, Chocolate, Buttermilk, or Custom) as well as 12 different heat settings. It also has Breville’s “Waffle IQ” technology, which automatically calculates the ideal cooking time to suit your preferred “waffle style” and level of crispiness. There are knobs to control the level of darkness as well as the heat intensity, and even a button labeled “A Bit More” for when you want it to go…a bit more. The end result? Four delicious, deep-grid Belgian waffles cooked to your most specific preferences. At 16 x 9 x 18 inches, the Breville Smart is a sizeable machine. But it’s all sleek stainless steel and has a low profile that won’t be an eyesore on the countertop. You already know if you need this machine — to those true connoisseurs of crispy, doughy perfection, the ultimate waffle is worth the splurge.